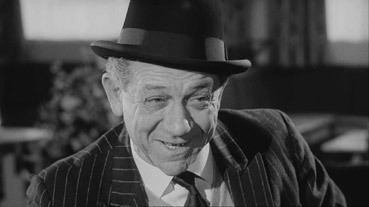 Can there be an English comedy film fan over 30 who does not instantly recognise the face and voice of Sid James? Memorably if simplistically capsulated by Leslie Halliwell as "Crumple-faced South African comedy actor," Sid is most frequently associated with the Carry On series, the majority of which he co-starred in and which provided him with two of him most memorable comedy roles – the Rumpo Kid in Carry on Cowboy and his hilarious barrow-boy Mark Anthony in Carry on Cleo ("Is the boss in?" he asks a centurion on approaching Caesar's door). Never destined for leading man stardom, Sid nonetheless had a busy career – his IMDb CV lists 138 roles in film and television between the years 1947 and 1976. A former ladies' hairdresser of some apparent repute in his native South Africa (I know, hard to believe isn't it), Sid's early film career consisted of small supporting parts and the occasional featured role in some very notable British dramas and thrillers. These include the father who suspects his second wife of foul play in the 1949 Man in Black, barkeep 'Knucksie Moran' in Powell and Pressburger's The Small Back Room, and Murdin in Edward Dmytrik's 1949 Give Us This Day (aka Christ in Concrete). But his uniquely ruffled looks, confident delivery and impossibly dirty laugh soon found him the comedy roles for which he was to be forever remembered. Nicely (and portentously, given the actor's later gambling addiction) cast as gambler Joe Clarence in the 1950 Last Holiday (written by J.B. Priestley and directed by Henry Cass), he made two more comedies in 1951 – Talk of a Million and The Galloping Major – before landing what is probably his most fondly remembered early role, as burglar Lackery in the 1951 Ealing classic The Lavender Hill Mob, written by T.E.B. Clarke and directed by Charles Crichton. Despite that film's success, Sid was back to small parts in his next few films and for a while even looked in danger of being typecast as the stock weather-beaten police sergeant, playing one in the Boulting Brothers' all-star tribute to William Friese-Greene, The Magic Box (1951), in Lewis Gilbert's 1952 thriller Cosh Boy and in Basil Dearden and Michaelo Relph's 1952 drama I Believe in You. But comedy and previous employers were to come to the rescue in Lewis Gilbert's Time Gentlemen Please! and T.E.B. Clarke and Charles Chrichton's 1953 The Titfield Thunderbolt. Sid continued to haunt the mid to lower end of cast lists for the rest of the decade and to mix the comedy roles with appearances in more serious-minded dramas, including Ralph Thomas's The Iron Petticoat (1956), Val Guest's Quatermass 2 and Cy Enfield's hard-nosed Hell Drivers (1957). He even had roles in a short spate of WW2 movies, with The Silent Enemy, Another Time, Another Place and I Was Monty's Double (all 1958). Outside of features it was a different story, thanks to the huge popularity of a radio and later TV series named Hancock's Half Hour, the show that had established Tony Hancock as one of Britain's most beloved comedy greats. As Hancock's dodgy-dealing friend and confidante, Sid was the only cast regular to survive the transfer from radio to television. Come the seventh season, however, he was dropped by Hancock himself, allegedly out of fear that Sid's character was proving as popular as Hancock's own and that his show was becoming a double act. In 1959 Sid landed the main supporting role alongside popular comedian Arthur Askey in Make Mine a Million (chronological the second film in this 3-disc set) and a decent enough part alongside Terry Thomas and George Cole in Too Many Crooks, but 1960 was to prove the turning point for Sid's film career. His earlier near-typecasting as a police sergeant finally bore fruit when he landed the central role of Sergeant Frank Wilkins in the fourth film in the popular Carry On series, Carry on Constable, a role that was to cement his place as a cast regular. Although he was to continue to work in other films, it's his roles in the Carry On comedies for which the second half of his career is best remembered. Indeed, his last six features were all Carry On films – the run would have been seven but for a break to play Sid Abbott in Bless This House, a role he would revive for 65 episodes of the TV spin-off between 1971 and 1976. It would be a naïve reviewer who would not suspect that Optimum's Sid James Collection came about largely because they had three films on their books in which Sid James appeared and saw little marketable value in two of them as stand-alones. And let's be honest, three films in a career of over a hundred is hardly a collection. But maybe I'm being too cynical. 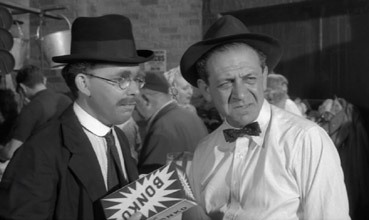 There are valid reasons for the inclusion of each – The Lavender Hill Mob is probably one of the most highly regarded films that Sid had a substantial role in, Make Mine a Million gave him one of his first headline credits and The Big Job surrounds him with British comedy performers of the time and some of the same cast and crew of the Carry-On series. All three discs are in sound shape and feature very good transfers, though extra features are virtually non-existent – a little background on each of the films and even James himself would have given the set itself more credibility as an intended collection. For more details on the films, including picture and sound information, see the individual reviews, which can be accessed from the links below. See individual reviews for plot summaries, technical details and extras.